Safety rail system, series 30. Approved to European Union standard. Categories: Safety Rail System, Safety Rail System. Safety rail systems are used to provide a mobile attachment point for persons working at height without a safety rail . With today’s greater awareness of workplace risks, builders and architects are seeking to ensure a high standard of safety by specifying systems that are purpose designed, tested and standards approved. Ronstan supports this approach, which can only improve the safety and security of the persons using these systems in their everyday work, and has developed safety rail systems which have been tested and certified by Lloyd’s Register. Further information and recommendations can be found in Marine Guidance Note MGN578 issued by the UK Maritime and Coastguard Agency (MCA). 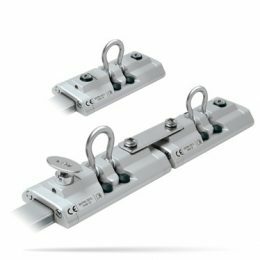 In addition to maritime standards, Ronstan safety rails have been tested to exceed European Standard EN795; 2012; Type D.
All safety rail systems are certified to meet European Standard EN795; 2012; Type D.
Marine grade aluminum alloy cars, safety rail tracks and end stops, anodized for corrosion protection and long service life. Safety rail system track rail can be mounted in either a vertical or horizontal plane as shown below. Provides a method of attachment for use in conjunction with personal protection equipment to protect against falls from a height, such as when working outside of conventional guardrails. Marine grade aluminium alloy cars, track rails and end stops, anodises for corrosion protection and long service life.